The Slotfather II is the newest game to hit the market. This new game is a 3D title that comes in amazing visuals and symbols that are paired with great animations and sound effects. This results in an engaging gaming experience that is immersive and fun to play. The game has a 5 reeled setup that houses 243 ways to win. 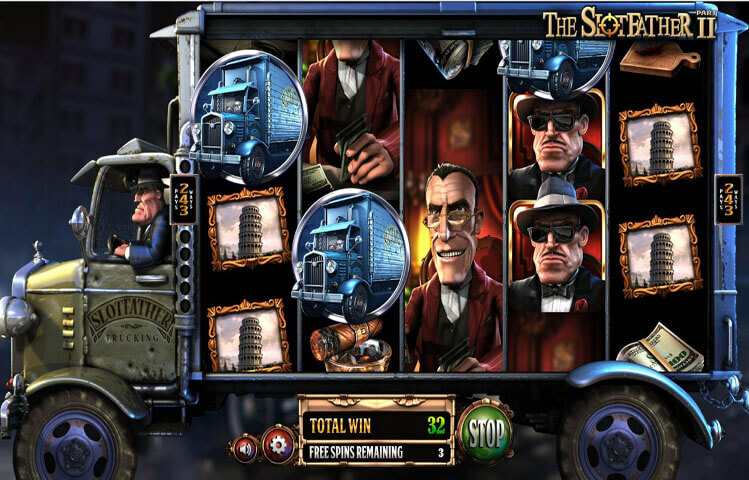 The game is the sequel to one of the most popular games by the developer, The Slotfather. Therefore, at Slotfather II, players will get to join the criminal gang lord once again in an action packed ride that has a lot of features and rewards. Betsoft Gaming knows how to keep its players entertained and rewarded, and that is by releasing brand new games every month. The new game for this month is The Slotfather II, which is the sequel to an old Betsoft Gaming title. Players will get to join the Slotfather once again, as well as his henchmen as they claim plenty of rewards and trigger many features along the experience. So players better be ready to join a group of criminals as they stack cash and rewards while enjoying a marvelous ride that is like none other. Since the game is developed by Betsoft gaming, players can expect to find an immersive ride that is presented in state of the art advanced visuals. The game is also a 3D slot, which means that all of the visuals, animations and icons of the game come in 3D. This helps depict the theme of the game perfectly to immerse players into the gangster underworld for a great ride. For starters, players will see the Slotfather himself sitting with his machine gun at hand on the left side. He is sitting in his gangster headquarter. As for the symbols that will appear across the reels of the game, they include the Slotfather and the different gangsters that work for him. Other icons include cigars, scotch glasses, machine guns, a cleaver, a briefcase full of money and stacks of green dollar bills. Since the game is from the selection of 3D slots of Betsoft, players can expect to find a lot of special features and symbols. For example, the slot comes with a wild icon, which is the wild briefcase. This briefcase can substitute for all other icons to help the players create a winning combo, but it cannot stand in for the scatter symbol. Speaking of the scatter, it is the truck icon. Three of these truck icons would trigger the free spins round that would give players from 8 up to 28 free games.